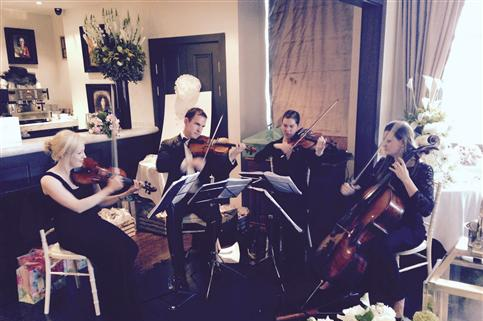 One great option for your wedding entertainment in London is to hire a Wedding String Quartet that will be both classy and fun. We get asked often how to combine one act for the wedding ceremony and the wedding reception. Or our clients ask do they need 2 completely different acts? Well unless you have something really specific in mind for the reception, then the answer is no. One of our wedding string quartets will play Mozart, Vivaldi and Bach as the guests arrive. This makes sense – it’s uplifting classical music and formal, but not too formal. But it’s your wedding, so you may prefer light or pop music. That’s fine, although we’ll always recognise tunes like ‘Kissing You’ by Des’ree and Sam Smith ‘Stay With Me’, rather than the uptempo Coldplay and Pharrell type songs, which work much better in the reception. The big entry is a chance to either go traditional with either the Wedding March or Pachelbel Canon – both fab choices. Or you may want to commission us to arrange a favourite song for string quartet to add a really personal touch! Another lovely choice is Kissing You by Des’ree. And another good classical one that is less frequently heard for the Bridal Entry is Largo by Vivaldi. It sounds beautiful for string quartet and is extremely elegant. Or ask us for ideas – we love to help with ceremony music. Then the Signing of the Register. You’re married so it’s almost time to really begin the big celebrations. But here, something gentle still works well. Moon River is a lovely tune. Or something like Elgar – Salut D’amour.. We even had a Groom who wanted his James Bond moment (and why not?!). He wore a DJ and during the Signing we played Skyfall theme by Adele. It went down very well with everyone! At the end of the ceremony, you walk down the aisle together to rapturous applause. Something triumphant like Coldplay’s Viva la Vida works well here. Or Happy by Pharrell. Afterwards loads of fun pop, jazz, film and TV works best – tunes people recognise but have never heard played by a string quartet. Whatever kind of music you want for your wedding, do consider a Wedding String Quartet. We can vouch for the fact that ours are never boring and we have loads of great music for every part of the wedding. It’s a wonderful and unique day – have superb music that fits the occasion.